That is all for our Premier League coverage for today. Thanks for joining us. We will be back on Tuesday with live text coverage of the Champions League quarter-finals. In the meantime, be sure to keep across the BBC Sport website, which will run a live European football text. Also, you can tune into Match of the Day 2 at 22:30 BST on BBC One, and from 23:20 for viewers in Scotland. Plus tonight there'll also be FA Cup highlights on from 23:20 on BBC One and from 00:10 in Scotland. Spurs boss Mauricio Pochettino on Harry Kane reaching 30 goals this season: "It's fantastic, congratulations to him because he deserves this moment, it's historic, the first time since Gary Lineker in 1992. I think he needs to pay for a dinner this week for his team-mates. The team work a lot and try and help the striker score." Tottenham manager Mauricio Pochettino speaking to Sky Sports: "Our performance was good. We deserved then win as we were better than Newcastle. "We need to be happy today. "We are recovering our good feeling. It is important because we are in a position where we can fight for something until the end of the season. "I got angry after we conceded a goal. We made big mistakes but after that the team reacted very well. Maybe it was good we conceded a goal early. "It's very important to finish the season on a good level and then we have to analyse." Thomas Rimer: Congrats Harry Kane! Brilliant season! Ryan Mould: Newcastle seem to be in freefall at the moment. They have a lot of rebuilding to do in the summer, starting with the manager. You can also text us on 81111 in the UK only - but please don't forget to tell us your name and location. Hats off to Harry Kane. England's newest star today became the first Tottenham striker to score 30 goals in a season since Gary Lineker in 1991-92. He's got five more games to add to that as well. Tottenham striker Harry Kane: "We deserved it today. We played well. We've had some disappointing performances in the last couple of weeks and we wanted to put that right. "I had a couple of chances and the keeper made some good saves but I'm delighted to get back on the scoresheet." Asked about the first Spurs player to reach the 30 mark since Gary Lineker, he added: "I'm very proud but there are five games left and, hopefully, I'll get a few more goals." It has been a bad day all-round for fifth-placed Liverpool. Not only did they lose the FA Cup semi-final against Aston Villa but Manchester City won to move seven points ahead of them in fourth and Tottenham have gone level on points with them with this victory. Spurs' push for Europe continues. Newcastle's fears of relegation remain. Boos from the home fans (the ones who are left in the ground) greet the whistle. The mood was bad here before kick-off. This will only make it worse. Three minutes of added time have been added. It won't make a difference. 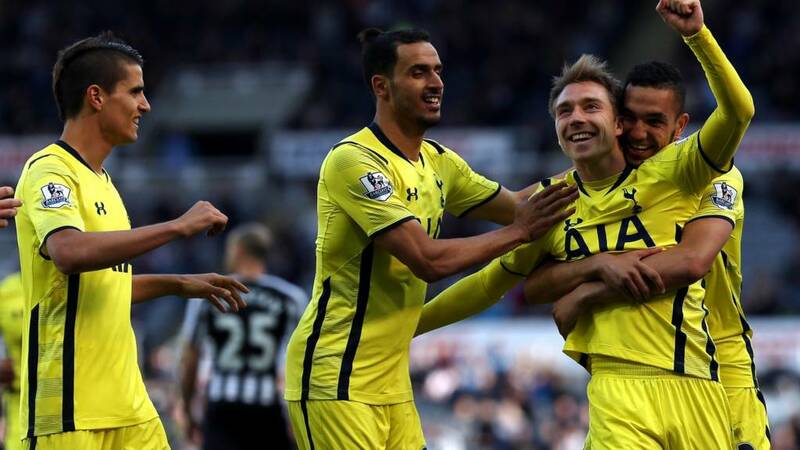 Tottenham are winning this game and Newcastle are slipping to a sixth straight defeat. "Newcastle put everybody forward in search of the equaliser and left themselves totally exposed at the back. As soon as you saw him bearing down on goal you knew Harry Kane was never going to miss that." Game over. Harry Kane has the final say with his 30th goal of the season, which also matches the 20 Premier League tally Sergio Aguero brought up for Manchester City earlier. Spurs break away and Erik Lamela plays ball to Kane on the charge and he makes no mistake with a side-foot finish past Tim Krul. Sammy Ameobi looks to salvage something for Newcastle with a driving run down the left and a low cross that is cleared by Tottenham. Paulinho is replaced by Ryan Mason as Nabil Bentaleb is booked for Tottenham for a foul. Play restarts with a Newcastle free-kick which they launch into the box, Tottenham clear and Daryl Janmaat fires wide from 20 yards. 90 seconds of normal time remain. That sums Newcastle's day up. A free-kick 35 yards from goal is played to the edge of the box for Ayoze Perez but he mis-controls and the ball skips away for a goal-kick. There were empty seats at kick-off. There are even more now. Some of the home fans have seen enough. Tottenham almost have a third as Federico Fazio challenges Tim Krul at the near post and bundles the ball out of his grasp and just past the post. Krul complains that he had the ball stolen, but the referee didn't whistle. It would have stood had it gone in. Danny Rose looks to have taken a bit of a knock to the back. Tottenham boss Mauricio Pochettino plays it safe and replaces him with Ben Davies. Newcastle are looking to avoid a sixth straight defeat. They are still not out of the relegation woods just yet. Have they got enough in the locker to change the outcome of this game from what looks like being another loss? Daryl Janmaat unleashes a shot from range but slices it way, way wide. Newcastle's final change sees striker Adam Armstrong come on for Vurnon Anita. Tottenham also make a change as Mousa Dembele replaces Nacer Chadli. Tim Krul is singlehandedly keeping Newcastle in this game. Erik Lamela makes a good run to the edge of the box to receive a pass forward and earn himself a clear sight of goal but Krul is alert and out in a flash to block with his arm. Oh, Harry Kane. Earlier in the season, everything he hit flew in but he is going through a little lean spell and it is not quite falling for him now. Earlier, Tim Krul denied him a goal with a superb save, but he is his own worst enemy here as he collects a Nabil Bentaleb chip in the box and shapes to shoot but loses his footing and pokes the ball harmlessly out for a goal-kick. Cameron, Sevenoaks: Newcastle are showing exactly what is wrong with the modern Premier League side. Bang average foreign players on jumped up wages! Bring through the local youth and give them a chance to show some guts and pride. The Newcastle players are chasing the ball but they aren't getting hold of it with anywhere near enough regularity to get them back into this game. And on the rare occasions they do have a chance to push for an equaliser they waste it. There is a resigned feeling to everything and everyone associated with the Magpies at the moment. Graham Green: The five stages of being a Newcastle fan: denial, anger, depression, anger, anger. Paulinho takes the corner and Harry Kane meets it on the volley from point-blank range but somehow Tim Krul manages to keep the ball out with a superb reflex save. How did that not go in? Replays show it definitely stayed out. The keeper has just kept his side in this. Jan Vertonghen leaves a leg hanging out to catch Ayoze Perez, concedes a free-kick on the edge of the box on the right and picks up a booking. Ryan Taylor chips in a cross from the set-piece that eventually falls to Perez at the back post but his low shot is blocked and cleared. Tottenham are starting to find spaces with worrying regularity for the home side now. Nacer Chadli has room to drive down the left and then float a cross over that is just a few yards ahead of Nabil Bentaleb in the middle. That lead-restoring goal has hit Newcastle hard. They look completely deflated. Harry Kane comes close to setting Christian Eriksen up in the box but a Newcastle defender sticks his leg out to prevent the cross reaching the Dane. Tottenham come within inches of scoring a third. Nabil Bentaleb charges into the box to meet a Nacer Chadli cross from the left but his header loops over the bar and on to the roof of the net. He should have scored. If he had that would surely have been game over. "Harry Kane was trying to claim that, wasn't he? Delivery into the box is so important and Christian Eriksen's delivery is so good there. If one of your players gets a nick on it, you are going to score. But even without an extra touch, that kind of ball can always creep in at the far post." Newcastle are not level for long. Having been fouled himself, Christian Eriksen dusts himself off and then curls over a free-kick into the box that is clearly designed to be a cross but beasts everyone, including Tim Krul, and finds the far corner. That could be a decisive blow, stamping out the home momentum. It is Eriksen's first goal since the end of January. Jack Colback needs to be careful. He may have scored but he also been booked and he walks a fine line by dragging down Christian Eriksen as the Dane broke into the Newcastle half. Now we could have a game on our hands. Newcastle have clearly come out with the bit between their teeth after a limp first-half. Apparently, there are 47,427 people in the crowd, which is the lowest crowd of the season at this ground. "Tottenham were comfortably on top in the first half and Newcastle had to change things at the break. I didn't think those changes would pay off that quickly but they have done." Would you believe it?! Just 18 seconds into the second half, Newcastke equalise as Ayoze Perez drives into the Tottenham box and sets up Daryl Janmaat for a shot that is blocked but followed up by Jack Colback to strike into the net. Finally, the hom fans have something to cheer. Here come the teams for the second half. John Carver clearly feels his side need something different. He's not wrong. A double change for the home side sees Gabriel Obertan and Sammy Ameobi come on for Mehdi Abied and Yoan Gouffran. "A plane, a protest and chances at a premium. Nacer Chadli's goal separates the two sides." "Tottenham dominated possession and dictated play. The fact that Newcastle are only playing one up top means they have never really looked like scoring." It has been a tough 45 minutes for those Newcastle fans who made the journey to St James' Park today. There is still a healthy crowd in the ground, despite the fan boycott, but they have been given another limp, directionless display from their side. Tottenham haven't been brilliant, but they haven't had to be. Recent history suggests their sole goal will be enough to get something from this game. Another away goal will likely seal the three points. Jamie McKellar: Newcastle showing just why they are near the bottom of the league. No heart, no passion, no ambition. Erik Lamela has lots of gel in his hair, but little brains in his head as he slides in very late on Vurnon Anita and picks up a yellow card. Another man into the book for a needless challenge. We've seen nothing of Harry Kane so far this game, but he almost doubles Spurs' lead with a shot from an angle after being found by Nacer Chadli. Tim Krul saves Newcastle from falling further behind with a smart block. Considering their recent form, that would probably have been curtains for Newcastle. Now Paulinho - who caught Remy Cabella earlier - goes into the book for a block on a Newcastle player in midfield. The ref allowed the game to continue but went back to caution the Spurs midfielder once the home attack had gone nowhere. "Newcastle have done well going forward for the formation they are playing. For the fact they are just sitting off and allowing Spurs to control possession they have got into the box quite a lot. Most of their balls have come to the far post though, and there haven't been any runs in there." Ayoze Perez looks to get his side going with a curling shot from 25 yards but Michel Vorm is a big man and he jumps and collects with ease. Soon after, Kevin Friend's patience runs out and Jack Colback is booked for a foul on Jan Vertonghen - a foul born more out of frustration than malice. There is an air of defeat already at St James' Park. This crowd needed their team to give them something to believe in and so far they have received nothing. Tottenham look the more proactive and, with that goal under their belt, composed and confident. Newcastle haven't scored two at home in a single game since 1 January. There have been a few moments where Kevin Friend could have reached for his pocket, but so far the referee has resisted. The latest sees Paulinho catch the heel of Remy Cabella. It won't have been pleasant for the Newcastle player but it didn't really need the Willem Dafoe Platoon-style reaction. "A great strike by Nacer Chadli. The ball bounced just in front of Tim Krul, who didn't really have a chance. But again Newcastle found themselves with no options in attack and they gave the ball away." If the mood around St James' Park was grim before it is even grimmer now as Nacer Chadli is gifted possession and then allowed to make ground, find space and pick his spot with a low curling shot from 25 yards to notch up his 11th goal of the season. It is the game's one moment of quality and with a bit of luck will spark it into life. Mark, Nottingham: Same old Spurs. Six games to go, season has fizzled out. Painful lack of quality. Big signings flatter to deceive. Yet another summer squad clear out and overhaul beckons. Depressing but predictable. Still plenty of empty seats at St James'. On the basis of what we have seen in the first 27 minutes, those who stayed away made a wise choice. "They must have a full tank of petrol up there. This plane has been flying around above us for ages. The best response Newcastle fans could do would be to send a plane to fly over the Stadium of Light with a picture of the league table." Oh, that was a chance for Spurs. Christian Eriksen breaks away and floats a cross to the edge of the box for Paulinho. He has two options: shoot or try to find Erik Lamela ahead of him. He opts for the latter and over-hits his first-time pass out of play. This game has yet to catch fire. Christian Eriksen has the chance to create something from a free-kick but he misjudges his delivery and swings it low and way too close to the Newcastle keeper Tim Krul who gathers with ease. Unfortunately, that plane flying by is the most exciting thing to happen so far. Some Sunderland fans are having a laugh at the expense of their neighbours. A plane flies over St James' pulling a banner that reads "5 in a row", referring to the number of derby victories the Black Cats have registered over Newcastle. Considering their current predicament in the table, I would have thought Sunderland fans might want to be chucking stones until their safety is assured. Meanwhile, on the pitch, Remy Cabella has a shot but it takes a deflection and loses any sting, making it easy for Michel Vorm to save. The first real shot on goal is produced by the home side as Yoan Gouffran's low cross into the box is hit first time by Ayoze Perez but saved by Michel Vorm. Nice move and much more promising from the home side. Tottenham get in behind the Newcastle defence as Danny Rose darts down the left, but his low cross is cut out before Nacer Chadli can produce what would surely have been a scoring touch from near point-blank range. It has been a pretty sedate opening 10 minutes. No real efforts on goal yet and only the briefest threat of any being produced. Erik Lamela allows a slow-moving pass to evade him and roll out for a throw by the left touchline. Pretty much sums it up the game so far. "I think Harry Kane caught an elbow in the eye. It was unintentional from Vurnon Anita, Kane almost walked into it." It has been an afternoon of stray arms in the Premier League. Vurnon Anita cathes Harry Kane with an elbow and the Spurs striker requires some treatment to clean up his lip. He looks OK to continue, though, much to the relief of Tottenham. Kane is the very last player they want to lose. Newcastle come forward down the left again, this time through Jack Colback, but like Remy Cabella before him the midfielder cannot beat the first man with his cross and Tottenham are able to clear. David Ljunggren: Now why do I think sorry, sad, slumping Newcastle are going to pull off a surprise and beat Spurs? Must be the spring sunshine. As Matt Lockwood just indicated, it is not the mass protest many of those involved might have hoped for at St James'. There are empty seats but still a decent crowd. In fact, there are a few Premier League clubs who would kill for a crowd this big. "I don't think the players will notice any of this protest. I'd say there are around 40,00 people here already. As a player you just concentrate on the game in any case." Tottenham get the game under way. Manchester City manager Manuel Pellegrini: "At this moment he (David Silva) is in hospital and they are checking if he has a broken bone in his cheek. "The referee was very near. He decides what happens and gave a yellow card. I hope that it was an accidental collision. "It was important to win because we come from two defeats. "We must continue working altogether and it is very important to finish as near to the top of the table as possible." The teams emerge from the tunnel at St James' Park, where there are still plenty of empty seats. By St James' Park standards it is pretty empty. That is not to say there won't be a mad rush for seats come kick-off, but it looks like there are going to be plenty of gaps in what is usually a sea of black and white. The announcer is doing his best to try and drum up some passion with requests for the home fans to make noise, which is greeted with a tame response. West Ham manager Sam Allardyce: "We gifted them two goals. It was pretty disappointing on the basis of how we conceded them. "You can't make the mistakes we made and expect to get anything out of the game. We created our two best chances late on but are not as clinical as we used to be. George Caulkin has tweeted this picture outside St James' Park. according to the Newcastle United Supporters Trust. They are continuing their protest about the way the club is run under owner Mike Ashley. Viv: Win for @MCFC but display not convincing for me. Apart from doggy formation/selection, the coach also does not have a plan B. "We need to improve after the international break, the two games against Burnley and Aston Villa were not good and we have the chance to get a good feeling again." "The first 15 minutes were exciting. Manchester City were powerful and direct but the game really fizzled out in the second half. There were a few sporadic attacks but that's about it." Manchester City return to winning ways, with the easiest win they are going to get all season. All the damage was done in the first half courtesy of James Collins' own goal and Sergio Aguero's 20th league goal of the season. They stay fourth in the table, a point behind city rivals Manchester United and now seven points ahead of fifth-placed Liverpool. City are seeing this out with a prolonged period of possession. They almost work an opening for Yaya Toure, but he is quickly crowded out in the box. Aleksandar Kolarov breaks away and is hauled back by Stewart Downing, who gets a booking for the act. Frank Lampard and Sergio Aguero have been withdrawn, with Edin Dzeko and Fernandinho on in their place. Dzeko has a chance to add to City's lead but he cannot get the ball out of his feet quickly enough in the box and his effort is tame and saved. Big Sam is out of his chair and screaming his lungs out at the officials. It seems to be in response to a foul on Winston Reid in the box by Fernando. It would have been a very soft penalty to give. Somehow, Big Sam's gum has stayed in his mouth after that. I'd have expected the fourth official to be picking out of his hair all evening. Another great chance for West Ham as City's sloppiness again comes to the fore. The home side gift possession to Kevin Nolan, who can run towards goal with only Joe Hart to beat. He fails to find a way past the keeper, though, who spreads himself well to block. There are going to be nine minutes added, largely as a result of David Silva's injury. "West Ham's best moment in this second half. A jinking run from Enner Valencia takes him beyond three City players, but he was just losing his footing as he prodded the ball across the goal and Kevin Nolan didn't quite have enough flexibility to readjust and turn it in." Newcastle defender Fabricio Coloccini returns from a three-match ban to skipper the side. The Argentine replaces Gabriel Obertan with Ryan Taylor moving into midfield. Yoan Gouffran replaces the suspended Moussa Sissoko. Tottenham make three changes to the side that lost to Aston Villa last weekend. Jan Vertonghen is in for Vlad Chiriches in defence, while Paulinho and Erik Lamela replace Ryan Mason and Andros Townsend in midfield. Newcastle XI: Krul; Janmaat, Coloccini, Williamson, Anita; Abeid, R.Taylor, Colback; Gouffran, Perez, Cabella. Oh, so close to a goal for West Ham. Enner Valencia jinks past a couple of challenges on the left and makes his way inside the box before prodding an effort that just evades Kevin Nolan and flies past the far post. It is a sign of life from the Hammers but way too little, way too late. "There's not been much going on in this second half. Even Manchester City are not going forward a great deal now. West Ham are defending better than in the first half. Often City's moves are breaking down towards the Hammers' left-back position, just when you expect them to deliver the ball into Sergio Aguero. City continue to dominate possession but they haven't created many chances." City continue to apply the pressure but struggle to get through the mass of purple shirts in and around the box until Yaya Toure finds a pocket of space to fire a shot over the bar from an angle. Big Sam is slumped again. Arms folded. Chewing. I'm not sure he's moved from that position since the third minute. Wait a minute, what's this? A West Ham shot at goal no less. Easily their best chance of the game. Matt Jarvis does well to cross low to Stewart Downing in the box but after allowing the ball to roll across his body in the box his low shot is blocked by Eliaquim Mangala. City pick up where they left off as they pour forward into West Ham territory but after reaching Yaya Toure's slightly over-hit pass down the left Aleksandar Kolarov's cross is cut out and cleared. I reckon we'll get about six or seven minutes of added time as a result of that Silva injury. Not that it is likely to change the result of this game. This has been as one-sided a game as you are ever likely to see. "Manchester City weren't going to rush this, they are going to make sure they do everything necessary so that David Silva gets what he requires. Let's hope Silva is OK."
Silva is strapped to a stretcher and receiving oxygen as he is carried from the pitch to warm applause. You have to hope that is mainly for precautionary reasons than the identification of a serious problem. Samir Nasri is Silva's replacement. Like for like. Silva is still getting treatment from the City medical staff on the pitch. There are a lot of worried looks on faces, including that of Manuel Pellegrini. "West Ham will be grateful for a bit of respite because they have had an awful lot of defending to do. It's becoming a bit of a forgetful second half if we're honest though." It doesn't look good for Silva. The medical staff are keeping his head very still as the stretcher is called for to carry the midfielder from the pitch. It was an accidental elbow from Kouyate, but it has cost City their influential Spaniard. Most worrying for City is if Silva will be fit to take part in the remainder of the season. David Silva dealt out a flailing arm and was booked just a few minutes ago. This time he is on the receiving end from Cheikhou Kouyate, who catches the Spaniard with his elbow. The West Ham midfielder gets a yellow and Silva requires some treatment. On comes Matt Jarvis and Kevin Nolan for Carlton Cole and Alex Song. Tom, Colchester: From a City's fan perspective this should've been the way we played all season. Since we lost to Stoke at home I knew it was going to be a rough season. West Ham are out of their own half, repeat out of their own half. Stewart Downing floats a cross to the back post where Carlton Cole rises highest but heads the ball harmlessly wide. Looks like we are going to see Kevin Nolan and Matt Jarvis soon. At some point I'm sure that West Ham will get out of their own half. It has to happen. Doesn't it? It is like attack v defence training for City, who go close again as David Silva drives a shot that hits a group of bodies in the box before being cleared. David Silva goes into the book for a flailing arm that catches Winston Reid near the throat. He goes down clutching his face. West Ham have not won away from home since 2 December. They have shown nothing here to suggest that is going to change. The City players are finding space at will in the Hammers half. A long period of pressure offers shooting chances for Yaya Toure, Aleksandar Kolarov and Frank Lampard before Sergio Aguero eventually tries one from inside the box that he fluffs, allowing West Ham to clear. It is surely only a matter of time before City score again. "Earlier we were asking some of our colleagues locally why Manchester City are not challenging for the title and we were told many performances have been more about the individuals than about the collective. But it's funny because today some of the individual performances out there have been simply outstanding." What a goal this could have been. Sergio Aguero plays a neat pass into Yaya Toure on the edge of the box and then darts into the box to receive the return ball, which Frank Lampard allows to run through his legs. Aguero has sight of goal but out comes Adrian to block. For a moment, Aguero looks like he has hurt himself but after a bit of treatment off the field he returns. Good news for City, terrible news for West Ham. West ham have gone 4-4-2, as opposed to the 4-5-1 they adopted in the first half. It means Enner Valencia is now up top with Carlton Cole. He has a chance to chase down a ball and potentially get in on goal but is easily muscled out of possession by Eliaquim Mangala. The second half starts as the first ended, with City on the attack. Jesus Navas looks to cross low to two team-mates on the edge of the box but a West Ham foot slides in to prevent in reaching them and clear. The Hammers get the second half under way. No changes to either team. The West Ham players are the first to emerge from the tunnel for the second half. You suspect their ears might still be ringing. Jono Forwood: To Liam O'Connor (see 45 mins), as a West Ham fan I can't give you an answer as to what's gone wrong this season but I would quite like an explanation as well! Steve Huish, Surbiton: What a player Sergio Aguero is. Twenty goals and to think he was injured for two months. If Wilfried Bony can get in the groove they could be deadly next season. Aston Villa: Given, Bacuna, Baker, Vlaar, Richardson, Cleverley, Westwood, Delph, N'Zogbia, Benteke, Grealish. Subs: Guzan, Okore, Sinclair, Weimann, Cole, Gil, Lowton. Liverpool: Mignolet, Can, Skrtel, Lovren, Markovic, Henderson, Allen, Moreno, Gerrard, Coutinho, Sterling. Subs: Jones, Johnson, Toure, Lambert, Manquillo, Borini, Balotelli. "It's a case of how many Manchester City want to get in the second half really. How much they want to push themselves in the glorious sunshine. The West Ham fans who have made the long trip up here deserve a side that's at least going to be brave, but if they leave themselves open by going forward they may have to take further punishment, as we saw with Sergio Aguero's goal." Adam Cordery: This game feels like a friendly. Joseph Murhpy: With the possible exception of Newcastle, West Ham is probably the best team for City to play to renew confidence. Paul Phillips: I must admit, bar a few defensive hiccups City's ball retention has been top notch. This has been sorely missed in the past. "Manchester City have been in control and then some. James Collins still can't quite believe he beat his goalkeeper from about 18 yards to put the home side in front. City are in cruise control and West Ham will do well to avoid a beating at the Etihad." Joe Hart leaves the field laughing and joking with the referee and his assistants. He probably wants to burn off some energy because he has had practically nothing to do. It's his birthday and he'll stand around not having to make saves if he wants to. There is no out-ball for West Ham. Every time they clear a City attack, the ball comes straight back as part of another home attack. Even Adrian is put under pressure and is forced to turn away from Jesus Navas before clearing. Just the one minute to be added before the Hammers get a much-needed 15 minutes to regroup. Liam O'Connor: Can a Hammers fan please tell me what happened there season? At the start they were exciting, dynamic and lovely to watch. Now? Terry Lambert: West Ham looking like Spurs at Man City. Asking for a beating. So poor it is unbelievable. Players have gone on holiday already. You have to wonder just what has happened to West Ham this season? During the early months they were an exciting attacking side, giving some of the best in the division a decent game. In contrast, this is a timid, almost apathetic display from them littered with mis-placed passes and poor control. "Manchester City are ripping through West Ham time and again. If the away side aren't careful this could turn into a very heavy score line. City are moving the ball quickly across the visitors' defence before stepping up the tempo another notch with a killer ball. A win would take them seven points clear of Liverpool and that should secure them Champions League football." This could get embarrassing for West Ham. City have the bit between their teeth and are constantly probing on the edge of the Hammers box. Frank Lampard gets a chance to cross but over-hits it and the ball sails out of play on the left touchline. "That is what this Manchester City side can do when they are in full flow. They just swarmed forward on the break. There were four players up in support of Sergio Aguero, whose composed slide under the goalkeeper puts City 2-0 up." Sergio Aguero's first century of City goals is complete and now he has begun his quest for a second. It is a lightning break away, which sees Yaya Toure win the ball from Stewart Downing, Aguero carry it and find Jesus Navas before collecting the return ball in the box for a finish under Adrian. It is a long way back for West Ham now. Frank Lampard has been making late runs into the box for about two decades now. He performs yet another to try and reach a flick from David Silva but is denied by a diving tackle from a West Ham defender. As the Hammers look to break, Alex Song is fouled by Jesus Navas for the game's first booking. "Manchester City are dominating play and even more to their credit, as soon as they lose the ball they are intent on winning it back straight away. West Ham are at least getting up the pitch a bit more now though. Carlton Cole had no support at all in the first 20 minutes." West Ham look to capitalise on their superior numbers but Enner Valencia's low drive from outside the box is saved by Joe Hart. Zabaleta returns - nose clean - and City are back up to 11 men. Birthday boy Joe Hart comes to the rescue after a hesitant piece of defending from martin Demichelis gifts the ball to Carlton Cole in the City half. Cole looks to charge into the home box from an angle on the left but Hart is quickly out to meet him and block. City are currently down to 10 men as Pablo Zabaleta has a bloody nose cleaned up. Normal service is resumed as City pour forward again. A chip to the right byline is met by Jesus Navas, whose drilled volleyed cross finds David Silva. The midfielder controls and shoots but his effort is blocked. That could easily have been 2-0. West Ham have a rare chance to create something as Stewart Downing gets the ball in acres of space on the right but his cross into the middle is way over the heads of three breaking team-mates. To be fair, even if they had reached that, an assistant's flag would have greeted them for offside. Adam Bevan: What a finish James Collins! Take a bow/hang your head in shame. Schoolboy J: One of the best own goals you will ever see. Collins like a boss! West ham look to claw their way back into the game from their second corner but a tame header from a corner drops comfortably for Joe Hart to gather. Big Sam is already slumped down in his seat, arms folded and chewing furiously on a piece of gum. This could be a long afternoon. The goal may have come from fortuitous circumstances but you can't deny that City have dominated the early stages of this game. There is a real attacking intent about their play, no doubt intended to make some amends for recent weeks. "James Collins just got his footing wrong. The ball sliced off him and in off the underside of the crossbar. On the balance of play that is no surprise. West Ham have showed Manchester City too much respect. They've not been in their face at all. City can now pick them off at will." Well, it has been coming. Not like this, though. Jesus Navas wins a header on halfway and charges into West Ham territory before curling a cross that James Collins slices over his own keeper and in off the bar from 18 yards out. It's a great finish, from City's point of view. A horror moment for the Hammers. Oh, not far away. Aleksandar Kolarov stands over a free-kick from 20 yards out. His curling effort nicks the wall and swings just past the post. West Ham's first tentative move into City territory wins them a corner, which they waste by taking quickly and then failing to get the ball effectively into the box. City have had about 75% of possession over the first 15 minutes. The Hammers can't afford to be so wasteful. Well, I suppose somebody had to crack the obvious joke. "West Ham seem to be unsure as to stick or twist. They're defending deep so as not to let Sergio Aguero have space in behind, but that allows Manchester City to just move the ball around in front of them. There's no way out for the visitors so far, City are having all of the play." Another City attack results in Jesus Navas crossing low for Sergio Aguero, who turns and shoots but straight at Adrian. West Ham are under some serious early pressure. City have set up camp on the edge of the West Ham box. The away side are doing well so far to stop them getting any further. Yaya Toure is fed the ball but he dwells for a second and is tackled. Soon after, David Silva picks up the ball 25 yards out but fires his shot a few yards wide of the top corner. Just getting under way over on BBC Radio 5 live sports extra is commentary of Chelsea v Liverpool in the Women's Super League. City have started well here. Aleksandar Kolarov is felled by Carl Jenkinson as he looks to break to the byline for a free-kick, which is swung in towards Yaya Toure but headed clear by an away defender. West Ham have barely looked at the City half, never mind be in it. "Manchester City have suffered only two defeats here all season, but their recent form has cost them. The loss against Crystal Palace really is the one that has cost them in their challenge to retain the Premier League title. "It's been a bright start from the home side, they're moving the ball very swiftly. Frank Lampard hasn't had the best of receptions so far from the visiting fans so far though." City come again, but Pablo Zabaleta's cross from the right is blocked by Enner Valencia. The full-back comes again and this time wins a corner, which is taken short to David Silva, who plays off the ball and takes the return in the box but cannot get his shot away before the tackle from Carlton Cole comes in to dispossess him. City get a feel for the ball early on, stroking it around in midfield before the ball is hammered forward for Jesus Navas, who controls down on the right wing and fires over a cross that West Ham are able to clear. It's Joe Hart's birthday today, by the way. The obvious joke would be something about buying him a cake. But let's not go there. We're better than that. Is the battle to avoid the drop more interesting than the fight for the title? Do you think Leicester will escape the drop? Adrian Thomas: The Foxes are flying and will definitely stay up. Best run in with four games at home out of six, plus are the form team at bottom. The most famous day in City's recent past lives long in the memory. How they could do with some Aguerooooooooo magic today. The crowd at the Etihad are currently being entertained by a young choir, all adorned in blue and white scarves, singing Oasis' Don't Look Back in Anger. I'm sure Noel and Liam would approve. "You are wrong if you think that, at this club, you are out if you don't win the title." This what Manuel Pellegrini had to say this week. On its own that seems like the statement of a man who feels he is still safe in his job. However, he then added: "If we miss the top four then maybe it will be different because that would not be the same thing. Not to play in the Champions League is a disaster." Maybe not so safe after all. As it stands, there are four points between fourth-placed City and that disaster. Liverpool's involvement in the FA Cup means they will have a game in hand on Pellegrini's men at the end of today. If the gap is still four points come this evening then the man steering the City ship better start turning that wheel because there is an iceberg, dead ahead. Daily Telegraph journalist Jason Burt: "Burnley v Leicester next Saturday is a huge match. The atmosphere at Leicester in their win over Swansea yesterday was fantastic, they really went for it from the start. Nigel Pearson makes a good point saying the job is not done yet though, they've only brought themselves back into contention. Yesterday was a big win for West Brom as well. They are now clear I'd say, even though they have a horrendous run-in." Former Liverpool defender Mark Lawrenson: "After their recent results Leicester fans now will be expecting them to win games and that expectation is totally different. it will be a test for the Leicester players." Hull defender Curtis Davies: "Leicester's recent results make it even more difficult for us. We drew 0-0 there when they were eight points behind us. Now it's ultimately down to us to go and do our jobs. We are the only ones who can ensure we stay in this league. We are going to have to find a way to get the points on the board and we're hoping we have got enough in our lockers. Matches against teams like Arsenal and Liverpool they are 'bonus ball' games, but now we need to get the points we will feel that in every single game. It's going to be key to us to beat Burnley especially though, because that is a six-pointer." James Pedersen: The final day - Leicester v QPR, Aston Villa v Burnley. Could be a straight shootout for survival. Squeaky bum time for fans everywhere. The panel discuss whether Steven Gerarrd should play for Liverpool and the prospects of Aston Villa and the Reds in their FA Cup semi-final. Former Liverpool defender Mark Lawrenson: "I think Steven Gerrard would have played before Lucas Leiva's injury. You have to manage the game and there is nobody better. Liverpool will probably play Raheem Sterling through middle and, with his range of passing, I would play Gerrard all day. If Villa come on to Liverpool that will suit them a bit more. Hull defender Curtis Davies: "If Villa win they will have to do so in 90 minutes. Aston Villa manager Tim Sherwood likes to play on the front foot and, from what I have heard, he is good to work with." Daily Telegraph journalist Jason Burt: "It is a really dangerous game for Liverpool. Aston Villa striker Christian Benteke is in fantastic form. Liverpool are playing quite well and the big question is if manager Brendan Rodgers brings Steven Gerrard back in. The bigger question is they are being damaged by striker Daniel Sturridge being out." The panel discuss the PFA player of the season list and the lack of defenders on it. Former Liverpool defender Mark Lawrenson: "It is more difficult playing up front than in defence. It is easier to stop people scoring than create." Hull defender Curtis Davies: "I voted for Eden Hazard as the player of the season. He can do everything, apart from tackle maybe." Daily Telegraph journalist Jason Burt: "John Terry is unlucky he is not on the list. He has had an exceptional season but we tend to go with the more creative players. It is a strong list and I wouldn't necessarily argue with anyone on it." Malc Wells: Don't see Leicester getting much from Southampton or Chelsea but three wins from the remaining six games just might do it. Game on. Klopp at Man City? Or West Ham? Daily Telegraph journalist Jason Burt: "If Manchester City don't finish in the top four then Manuel Pellegrini is gone. If they do then he will have a lot of questions to answer at the end of the season, explaining why the wheels have fallen off in the way they have. Names like Jurgen Klopp have been ruled out, and Pep Guardiola is the dream ticket but that's unlikely at the moment. I actually think Klopp could be attracted by the idea of a project. The idea of going to a club that is not yet a top club but that could become one. There have been reports linking him to West Ham and maybe that's a step too far at the moment but I do think there could be an attraction there." Former Liverpool defender Mark Lawrenson: "City's infatuation with Guardiola is because the two Spanish guys at the club know him so well. I like Klopp. Pellegrini is not in your face but Klopp is, and there is something about him that makes you want to play for him." In Jurgen Klopp related news, former Mainz boss Thomas Tuchel will replace him as coach of Borussia Dortmund this summer. It is a familiar feeling for Tuchel, who took charge of Mainz a year after Klopp left the club to join Dortmund in 2008. He has been out of work for a season having taken a break from the game. Tuchel, 41, has been linked with Newcastle recently, but Mike Ashley will have to look elsewhere now. "I think Liverpool manager Brendan Rodgers should start Steven Gerrard. It's the Hillsborough anniversary, there is a lot emotion around the club and one of their best players of all time is about to leave. They should get him in the team and build it around him. A top player of his quality should be in that side." "In regards to the situation of Raheem Sterling and Liverpool I'd say there is blame on both sides. He has developed really quickly, evolved into a super footballer, but you have to remember Liverpool have given him that platform. He needs to show them a bit of respect too. It wouldn't surprise me if Liverpool let him go in the summer if they get a big enough offer. "We might see Steven Gerrard on the bench today but if Liverpool reach the final for me it would be inevitable he would lead the team out." On Sunday's FA Cup semi-final: "As a former Aston Villa player you can't tell me this is a bigger game for Liverpool. Tim Sherwood has done an incredible job. I wouldn't fancy playing against Benteke today. He will shake up Skrtel. "Gerrard is the talking point, you have to play him. The emotion that surrounds him, we saw what he did in an FA Cup final against West Ham and he deserves the opportunity to do it again." On Arsenal's progress into the final: "Arsenal will be extremely relieved. They were given a real fright. If you're an Arsenal player you know you've been lucky. You could see on Arsene Wenger's face he was a very relieved man. For him personally, the pressure he is under, he wants the opportunity to win something. It's going to be progress for Arsenal. They could finish second or third and win a trophy." We have some FA Cup team news to bring you, and it is a blow to Liverpool, who will be without Lucas Leiva this afternoon. The midfielder a thigh injury. However, that could now pave the way for Steven Gerrard to start the match at Wembley. Gerrard has, however, played just 27 competitive minutess since picking up an injury of his own against Spurs in Feb. He did play in a behind closed doors friendly for Liverpool this week. Under-pressure Manchester City manager Manuel Pellegrini make four changes following his side's 4-2 defeat by Manchester United last Sunday. Centre-back Eliaquim Mangala, left-back Aleksandar Kolarov as well as midfielders Fernando and Frank Lampard come in for the injured Vincent Kompany, Gael Clichy, Fernandinho and James Milner. West Ham striker Diafra Sakho has a thigh injury and is replaced by Carlton Cole as the only change from the draw with Stoke last time out. Man City XI: Hart, Zabaleta, Demichelis, Mangala, Kolarov, Fernando, Navas, Yaya Toure, Lampard, Silva, Aguero. West Ham XI: Adrian, Reid, Cresswell, Kouyate, Downing, Noble, Jenkinson, Collins, Cole, Song, Valencia. The panel discuss why Manchester City have struggled to retain their title. Former Liverpool defender Mark Lawrenson: "It is difficult to retain the title. Chelsea are gong to win it and you know that every single week they are always at it. When you walk into the dressing room the season after winning the league the first thing you think is 'has he signed someone who will replace me.' It's selfish. But City have so many players who just walk into the team. How many of them were at the same level as last year? I'd argue nobody." Hull defender Curtis Davies: "They haven't had too many injuries. It's just strange to see. A few bad weeks and you go from having a wonderful season to a bad one." Daily Telegraph journalist Jason Burt: "I think if they don't finish in the top four Pellegrini is gone. I think if they lose today he may be in danger of not seeing the end of the season. There will be a big end of season review with the owners of the club. There is a whole root and branch look at what's happened at the club to be had." separate live text commentary from our colleagues in Scotland. West Ham had hopes of challenging for a European spot at one point this season but one win in their last 10 top-flight games looks to have put paid to that. Their manager Sam Allardyce shares doubts about the future of his job along with today's counterpart in Manchester City's Manuel Pellegrini. Allardyce's contract expires in the summer and the silence about extending his deal from the club's owners is deafening. Striker Carlton Cole comes in to the West Ham side to face Man City in place of Diafra Sakho, who has a thigh injury. Hull defender Curtis Davies: "Jose Mourinho is a master tactician. He knows against that when playing the big sides he doesn't have to chase the win. Chelsea sat back and soaked up the pressure. They had less than half the passes United had, and that alone shows that he knows what he is doing. United can take positives from the performance knowing that they should be able to make the top four though." Daily Telegraph journalist Jason Burt: "I think we've got a bit carried away with praising United. It's taken them a long time to get to his point. Yesterday was their 39th competitive game of the season, and I think they should be closer to the top. They had one bad season last year, they spent an awful lot of money on new players and a lot of them haven't performed. I think they'll finish third, but it will be 10 or 12 points behind Chelsea. They should have done better, and I think there will be a big summer of change at Old Trafford. I think they'll sign four or five new players." Former Liverpool defender Mark Lawrenson: "Chelsea did a number on Manchester United. United were outstanding without being able to score the goal, but that is Chelsea, and that is what Jose Mourinho does. I don't know why we seem to be so surprised by it. In fairness to United over the last three or four months they have had nothing but positives. That turnaround coincided with Robin van Persie's injury, when Wayne Rooney was moved back up front where he's a completely different animal. There's more urgency in their play, which is so easy to play against. They have to play at a certain pace with the players they have got." Manchester City make four changes from the 4-2 defeat by Manchester United. Frank Lampard starts in midfield, as does Fernando. Eliaquim Mangala starts in place of the injured Vincent Kompany. Manchester City boss Manuel Pellegrini was celebrating winning the title after beating West Ham in the final game of last season. This time he welcomes West Ham to the Etihad with the defence of that title in tatters and doubts about his job as City lie 12 points behind leaders Chelsea. And, rather than challenging for the top-flight crown, Pellegrini's side are more concerned about holding on to their top four spot in order to secure a place in next season's Champions League. Manchester United boss Louis van Gaal's interview with Match of the Day commentator Guy Mowbray after his side's 1-0 loss at Chelsea on Saturday evening. I think it is fair to say that Van Gaal was spoiling for an argument from the word go.